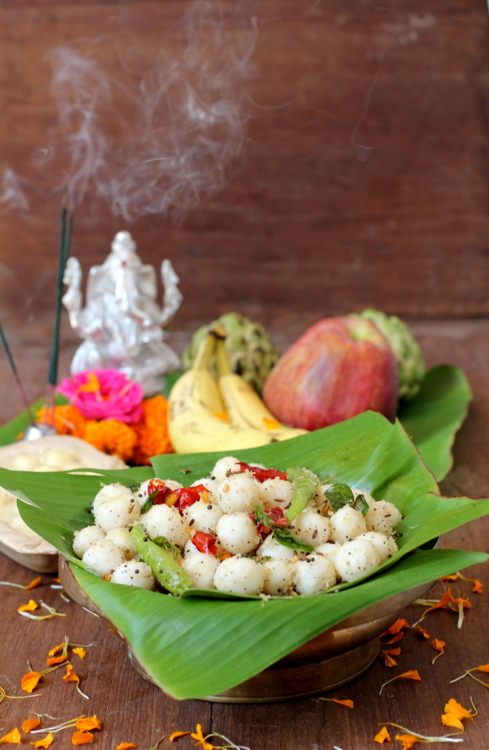 Ammini Kozhukattai ~ a savory rice flour based dish that is popular in Tamil Nadu is a special festival dish prepared for Vinayaka Chavithi. 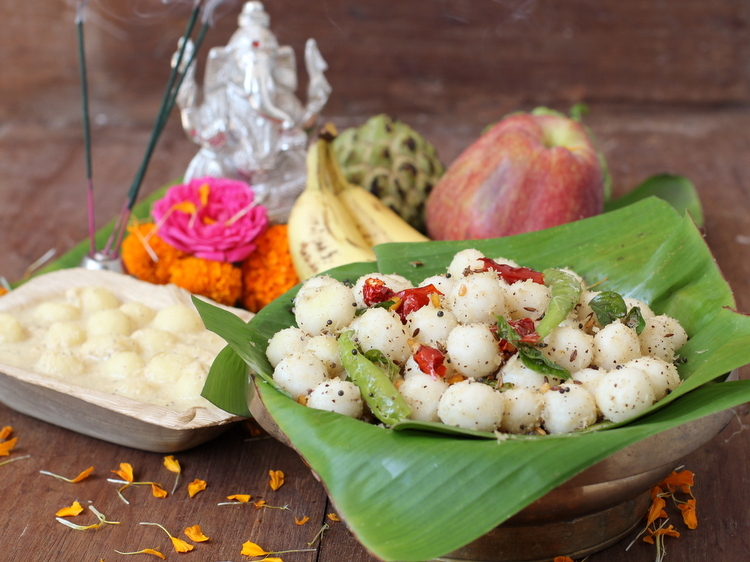 Steamed marble sized rice flour balls are tossed in a tempering of spices which include asafoetida and aromatic curry leaves. In Andhra, it goes by the name Undrallu Guggillu or Talimpu Undrallu similar to Talimpu Senagalu. Usually, left over undrallu rice flour dough is used to prepare this kara aka savory style dish. I must mention that shaping the dough into small sized balls is a time consuming process. But definitely worth the effort. 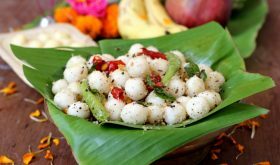 These are best prepared with home made rice flour which yields a soft kozhukattai. Often store bought flour yields tough rice flour balls on steaming. They make for a low fat evening snack or a light meal. Just mix some spicy karam podi or idli milagai podi over the hot Ammini Kozhukattai, toss well and eat when warm. Highly addictive, I tell you. 🙂 Vegans can omit ghee and use oil. Add salt, 1/4 tsp ghee and bring water to boil, add the rice flour and stir it continuously such that there are no lumps. Turn off flame and cover with a lid. Allow to cool. Grease hand and knead for a few seconds to make a smooth dough. Make small balls and place them in a greased stainless steel vessel. Drizzle a tsp of oil all over the balls. Heat water in a pressure cooker and place the stainless steel vessel in the cooker and place the lid. Steam on high with lid for 15 mts (without weight). Turn off flame and allow the pressure to reduce completely before removing the lid. Keep aside the steamed rice flour balls. Heat oil for tempering in a cooking vessel. Add mustard seeds and allow to splutter. Add cumin seeds, urad dal, chana dal and allow the dals to turn red. Add green chilis, red chilis, curry leaves and asafoetida and mix for a few seconds. Add grated coconut and mix for a mt. Immediately add the steamed rice flour balls in the tempering and mix well. Turn off flame and remove to a serving bowl. Use home made rice flour. If you do not have it on hand, use store bought rice flour. To make rice flour at home. Soak 2 cups rice in water for 4 hours. Drain completely and dry indoors for a couple of hours. Grind to a fine powder and sieve, Grind the coarse rice flour again and sieve again to get very fine rice flour. Store in a stainless steel container for a few weeks. Fresh coriander can be added as a final garnish. By Sailu Published: September 7, 2013 Ammini Kozhukattai is a South Indian style rice flour based dish among Vinayaka Chavithi recipes. Known as Undrallu Guggillu or Undrallu Talimpu in Andhra. In the 3rd point,is it not steam without the weight instead of lid? Please clarify use of the pressure cooker. Also, for those without a pressure cooker, how to steam? Sounds delicious! For those without a pressure cooker. You can place a large stainless steel vessel with 1 1/2 cups of water on the stove. Place the vessel (obviously smaller in size) with the rice balls (with lid) in the water. Place lid over the larger vessel and allow to cook on medium flame. This could take a good 30 mts to steam. I love Ammini Kozhukattais. Its soo easy to make and easier to eat!! !